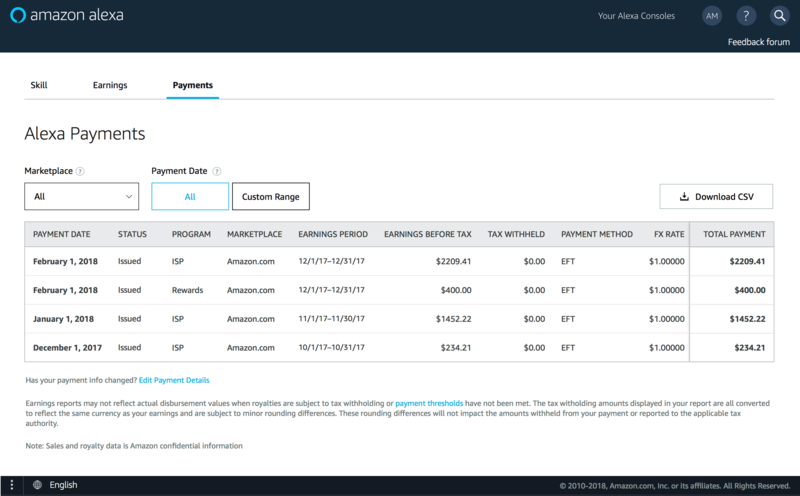 Navigate to the Alexa Skills dashboard in the developer console to see your payments and earnings for in-skill products. This page provides an overview of the metrics used for in-skill products. Note: The Earnings and Payments sections are only available to those users who have been assigned an Administrator or Analyst role. 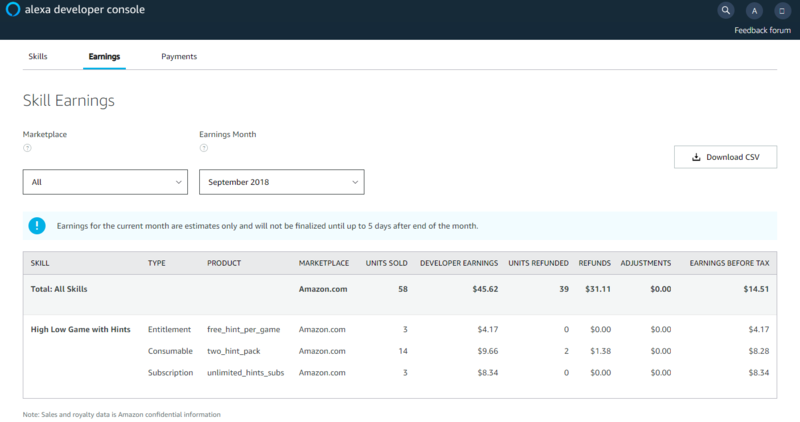 The Earnings section displays the amount of earnings you have received from in-skill purchases or Alexa Developer Rewards each month. The Payments section displays payments made to you for in-skill purchases or Alexa Developer Rewards. Note, the Earnings and Payments sections can be downloaded as a CSV file. Type Earnings come from In-Skill Purchases (ISP) or Alexa Developer Rewards (Rewards). For ISP, the type shows the type of product: Entitlement (one-time purchase), Consumable, or Subscription (recurring purchase). Product The name of the entitlement, consumable, or subscription product. Units Sold The gross number of times customers were charged for one-time purchases/consumables or active paid subscriptions. Units Sold does not include credit card charges that are still pending or that were later declined. This number may differ from Purchases which includes all offers accepted by customers. Developer Earnings Your gross share of monthly earnings. Units Refunded The number of one-time purchase, consumable, or subscription charges that were refunded. Refunds Your royalty portion of the total amount that was refunded to customers. Adjustments Adjustments are typically adhoc in nature, not associated with specific transactions, and could include certain price promotions and other manual fixes. Earnings Before Tax Your earnings after refunds and adjustments. Actual payment amounts may differ when royalties are subject to tax withholding or payment thresholds have not been met. Learn more about tax and earnings. Status All payments are considered Issued after Amazon has disbursed your payment. A payment is Failed when your bank is unable to receive your funds, usually caused by a problem with your payment settings. Program Earnings can come from In-Skill Purchases (ISP) or Alexa Developer Rewards (Rewards). Tax Withheld The taxes Amazon withholds from your earnings due to tax withholding requirements. For more about taxes, check out Set Up Tax Forms for Your Account. Payment Method The method used to disburse your payment such as Electronic Funds Transfer (EFT) or check. FX Rate The exchange rate used by your bank to convert earnings to your home currency. Total Payment Your total earnings from each marketplace in your home currency. Final amounts may not appear until your bank confirms receipt of funds.